- Scrolling logo appears and (V)RAM figures are shown for a few seconds. If at the beep you're having the Esc key pressed, it goes to Basic, otherwise to the Designer. Thanks Hrothgar ! I'm pretty sure I get no beeps... but let's not panic until I get my converters (~ 7 days). I know, I know... I'ill invest in a direct converter/monitor at some point :P .
You may remember my MSX SCART -> PC VGA issue display issue. Well the solution was kinda working but imperfect (bad image). And anyway I decided to get to the bottom of it. - it does not send the same type of "sync" beam. So we obviously need a line/scan doubler, with VGA final output. It will upscale the definition and also generate these 30 kHz/sync things for us. 2 quality solutions are still on the market : OSSC and japanese Framemeister XRGB. They are fine but also DAMN EXPENSIVE; so let's consider we do not want to sell our house, and get a chinese GBS-8200 derivative instead. 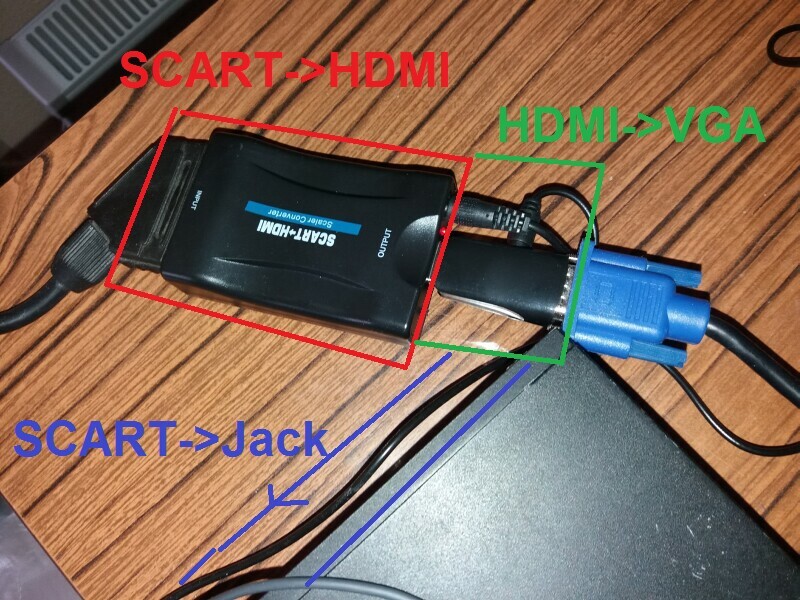 - a SCART-extension-with-Jack-Audio-derivate, which will "isolate" the audio channel and let us plug our speakers. - a SCART-to-RGB+Composite adapter, with its associated cable. So here you have all the stuff. Plug this all together in the right order, power it on (GBS-8200 comes with a DC input ; so did the former HDMI/VGA converters), and you're good to go. Well ? Well, there may still a problem (in fact, I had this VERY problem). 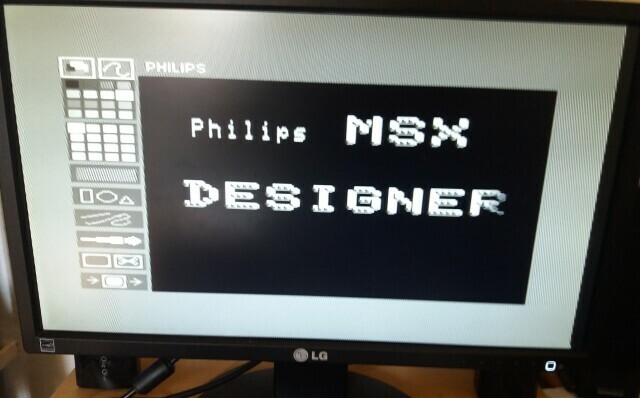 I live in Europe and my MSX is, well, European -Philips : it outputs at a 50 Hz rate. Good PAL ! But at first my display was totally black-on-white. So was I complaining until I ran the Bubble Rain game, which forces 60 Hz at startup and... Magic ! Color everywhere ! So it happens that GBS-8200 _may_ handle 60 Hz better than 50 Hz. It depends on your batch, luck and the position of Pluto. Let's say we are paying the "price" of a cheap Chinese replacement. But no worries, 'cause it also happens that this version of SIDplay comes with a cool utility named HZ.COM. Run it from MSX-DOS, and it will switch your VDP to 60 Hz. Go even further, put in into your AUTOEXEC.BAT ^^. Description says it's a SCART to YUV (Component) converter, If that's the case then sync is mixed with the Y signal and it's OK for the GBS. But if it doesn't have a conversion circuit inside, and it's just a pass trough meant for devices that already output YUV, I have to wonder how your GBS can possibly work without a sync signal. Anyway, go here: . Add the arduino board and do the mods described. The GBS will become an amazing device instead of a temperamental crappy one. If you add the 100 Ohm resistor to the sync you can also ditch the SCART to YUV converter and use the SCART to VGA cable from your first post. Haha, got tired of keeping this [Esc] key pressed each time ? 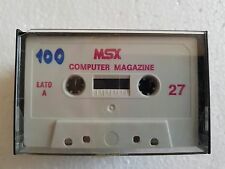 In fact I envisioned doing the same, but having already cleaned the insides and taken a few odds, I didn't want to risk breaking my precious MSX ^^. There are a lot of confusing and contradictory info on glorious Internet ; some people say this sync signal isn't needed, others that it generates noise in the final picture, and now I finally learn not only that it's required, but that my converter works for a totally different reason. Thanks for the URL, this seems to be the way to go further ! Not now though, I'm tired by all this hard work ^^.